As a true believer in the new TV-as-art, I’ve been waiting for years for someone to write an Easy Riders, Raging Bulls for the HBO era. It’s one thing to rant over cocktails about the genius of today’s TV, it’s another to go out and do the research, explaining exactly what happened and why, what the technological and commercial forces were, who the visionaries were, why they had these particular visions, why their creations resonated with viewers, and how it all came together and spawned more. Martin does all that, with dry wit and a flair for juicy detail. This is the book for people who want to know how Breaking Bad showrunner Vince Gilligan discovered Bryan Cranston when casting a particularly difficult bad-guy role for a one-off X-Files episode. Or who have always subconsciously wondered why and how The Sopranos had that particular theme song, in somewhat a weird genre for a mafia show. The author takes us from the “picturesque but receptionless” hills in eastern Pennsylvania where cable television was born to the detailed behind-the-scenes politics of the writers’ rooms of the shows that defined a new era. The era, according to Martin, is of the antihero and the “difficult man” writer or showrunner behind him. It’s a useful organizational theme, if limiting. Tony Soprano, the argument goes, proved that viewers would watch “unhappy, morally compromised, complicated, deeply human” characters and, TV being what it is, spawned a legion of such characters, from Nate Fischer and Vic Mackey to ultimate antihero, Walter White from Breaking Bad. It’s all true. And of course, there are things you can say about how antiheros resonate in insecure, post-9/11 America. But for me, that’s where the book skated on thinner ice. In my opinion, the antihero is the gimmick that allows television to ask serious questions about morality and contemporary society. As David Simon, creator of The Wire said to Martin, the show was supposed to be “a piece of social activism.” Viewers do watch Tony Soprano or Don Draper as wish fulfillment, because these characters break rules that ordinary men can’t, but that truth can obscures the deeper ways both shows are about rules, and how we as a society make them, and why. 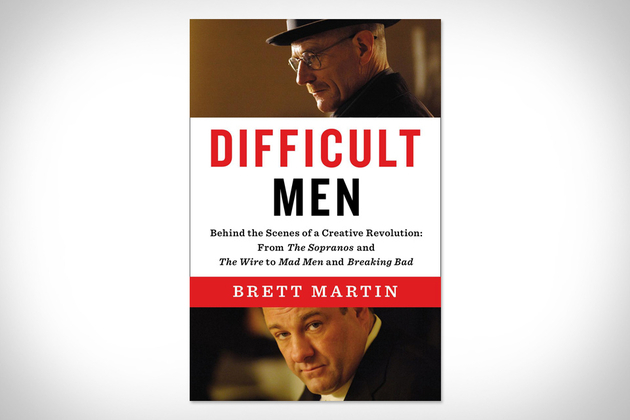 Still, Difficult Men is an authoritative–downright riveting–account of the stories behind these shows. This is especially important to note since the book was robbed in its NY Times review by Michiko Kakutani, which claims, unfairly, that “large swaths of Mr. Martin’s new book, “Difficult Men,” will be familiar to readers of Alan Sepinwall’s popular blog, What’s Alan Watching?, and his astute 2012 book, “The Revolution Was Televised,”” and then goes on to complain that the book’s thesis is too narrrow to include other shows Michiko Kakutani likes.